Cleaning out your garage is a wasted effort if you don't organize the stuff you have left. Without some arrangements, it will be only a matter of time before you can't walk through it again. But never fear, you're a Do-It-Yourselfer and your talents will not go to waste. 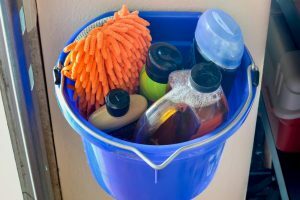 So, once you've completed the hard part of getting rid of all the crap in your garage, we've gathered some of the best DIY plans and hacks to help you get your garage organized once and for all. The first thing you need to build is a workbench. You need one, it is the most important tool for any garage. All you need are a few 2x4s and some plywood. 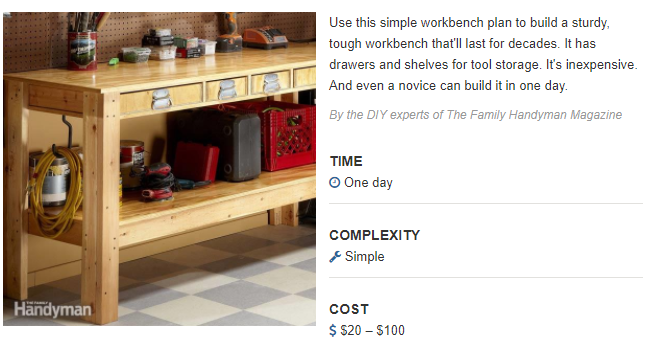 With these simple plans, you can craft a tough and sturdy table to handle any of your DIY tasks. You can even go the extra mile and add some drawers. Just follow these easy plans by the Family Handyman. You've got a lot of tools. Screwdrivers, drills, wrenches, fifteen hammers, because that's what your kids pick out every Christmas; at least it's not ties. But where are you going to put all those tools? 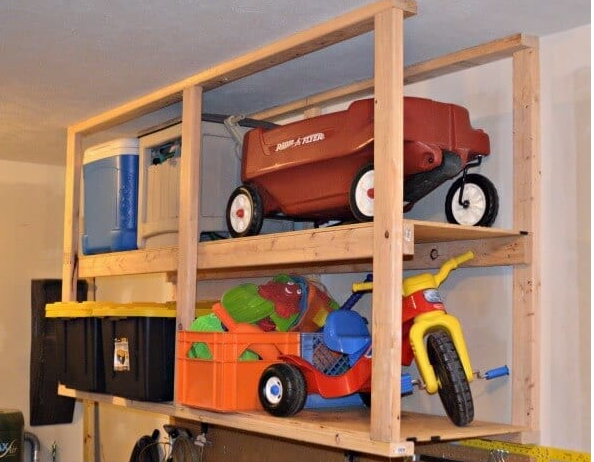 Simple, make use of the vertical space in the garage. 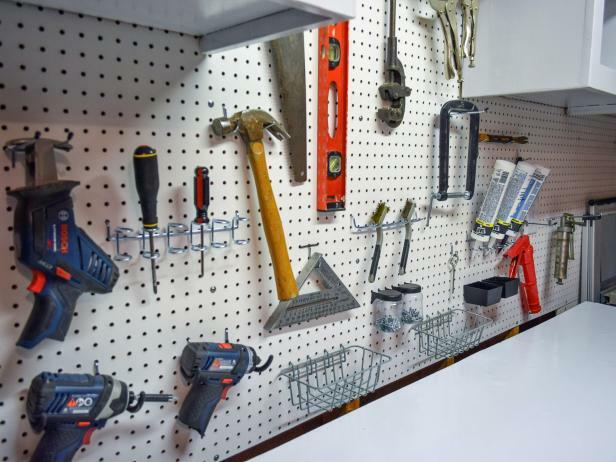 Install a pegboard and let the simplicity of its genius make storage and organization easy. Installing a pegboard couldn’t be easier. You can pretty much just cut it to the right size and attach it to the studs. It doesn’t get much simpler than that. But in case you need a little more instruction take a look at how the guys at DIY Network installed thiers. Of course what is a garage without some DIY shelves? A mess. That's why everybody and their mother has built and installed shelves in their garage. There is no end to the available plans, styles, and designs online. But here is a simple, easy, and cheap way of setting up shelves for all of your sleeping bags, camo, Yetis, flint, bull urine. Or whatever. Don’t forget you can make use of the overhead space, too. While these are a little riskier, meaning don’t screw it up or they’ll destroy your drywall when they come crashing down, building overhead shelves isn’t much different from vertical shelves. Just don’t cut any corners, stick to the plans. That'll take care of the bulk but you still have a bunch of important crap to store. 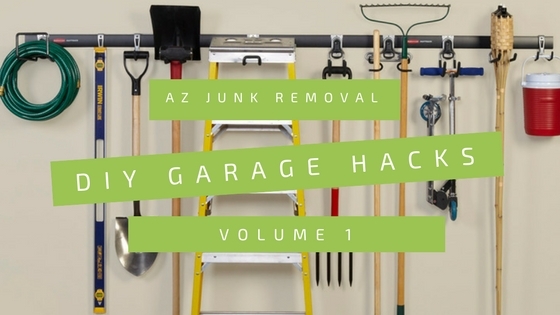 Try some of our organizational hacks to deal with your miscellaneous garage gadgets. Hit your local feed store, and grab a flat backed feed bucket. Then stuff all of your wash, wax, polish, and towels right inside. Now you can hang the bucket up by its flat side using a picture hanger; freeing up space in the cabinets. 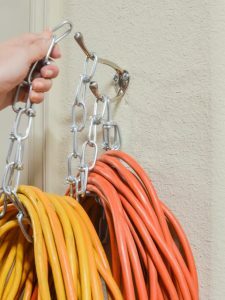 Another easy hack is as simple as screwing a coat hanger into the wall and using a chain to hang up all of your extension cords. If you have a lot of them make sure to screw the coat hanger into a stud. Now finish setting up the rest of your gear for storage. Sort and store it by priority. If you need it really often put it up close in an easy to reach space. If you need it but not very often put it on the shelf in the back or overhead. Finally, if you don't need it get rid of it. Donate it and get a receipt to use for your tax return next year.